Would you believe… it’s something new? Beyond being an online Get Smart shrine, it became a library of sorts for various news articles on the show, which I had collected over the years. Other fans have also contributed to that part of the site with their own collection of GS articles. In addition, I also added a section on all the goofy nit-picky things we would debate on the GS list serve and during our old Friday night chat sessions. I had not gotten to the point of doing anything with episodes specifically, so that is going to be the primary focus of this blog. My personal challenge is to go through each episode and then write some sort of yarn about it here. 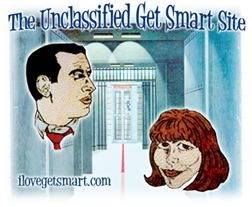 Other notions for this blog include a few words about some of the Get Smart collectibles out there. This blog is going to be focused on the original series. The section on my website regarding the 2008 movie is about all the time I’m going to spend on that. One thing of note: I’m going to go through the episodes in the order that they appear on the DVDs. The episodes on the DVDs are in order by their original air date. The show wasn’t always aired that way in syndication. For example, Diplomat’s Daughter was the second episode to air, but for those that grew up watching GS on Nick at Night or TVLand, the second episode is Our Man in Toyland. 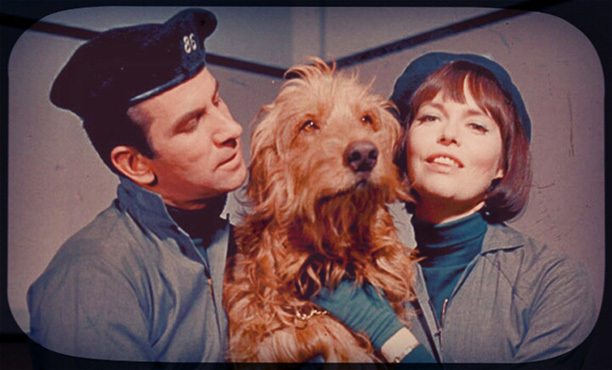 Syndication of the series had another issue – some episodes were not shown as often as others. This matter was addressed over in The Smartian Controversies, but it largely boils down to contract. Syndicated episodes have various scenes cut out of them – which is a whole other thing depending on which network you watched your reruns on. Nick at Nite aired GS in the early ’90s and pulled it in early 1995. TVLand began airing GS in 2001. Each channel had different edits of the show and at the time caused a bit of fan confusion. And I suppose you’re wondering where you can ‘get’ Smart? See what I did there 😉 The DVDs are easily available via the internet and are available in two versions – the Time-Life box set and the HBO release. The Time-Life version has all kinds and varieties of extras. Choose wisely. Get Smart is being shown around the world and in the U.S. The show airs on MeTV out of Chicago. Most pay TV providers offer it. Even better, you can also get the channel over the air. Thanks to my handy dandy TV antenna, I watch an hour of the show on South Bend, Indiana Channel 57.2 during MeTV’s Sunday night Spy Block. MeTV airs the show on Sunday at 1 and 1:30 a.m. and 11 and 11:30 p.m. CDT. If you think that’s a little too late, I will point out that there was a six year period where GS wasn’t shown at all in the U.S., so I’ll take what I can get. Would you believe I have fond memories of staying up ‘til the crack of 2 a.m. to watch it on Nick at Nite? This Sunbeam and cardboard Max belong to Get Smart fan Sue Kesler. 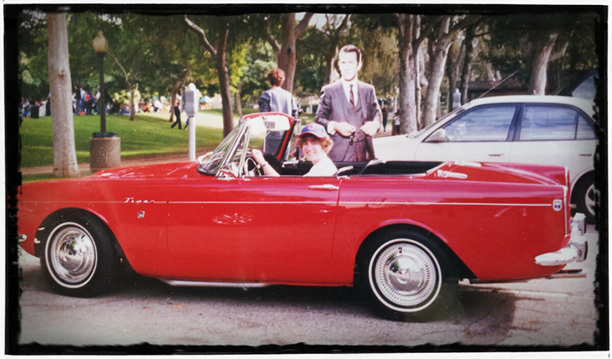 She let myself (pictured) and other fans sit in her ultimate GS collectible during the Get Smart in the Park portion of the Get Smart Gathering in Beverly Hills in 2003.